A map Buenavista Norte for walking and cycling. May the following Tenerife map Buenavista Norte help you to locate the most important locations of the Isla Baja and the Teno Alto mountains. Start by looking at the contours of the Isla Baja on the Northwest coast of the biggest of all Canary Islands. Map Buenavista del Norte with Teno Alto of Tenerife Spain. Your utmost point is Los Silos outside the Teno Alto at top right. From there get to Garachico or to Buenavista on the TF42. La Caleta de Interian is located half way by the coast. Proceed from Buenavista to Punto del Fraile and the Punta Teno lighthouse. Note on the orientation map of the biggest Canary Island of the high Teno or Teno Macizo the road TF 436 from Buenavista as far as Santiago del Teide. This spot is your outermost point on the right before reaching town of giant cliffs on the very bottom tip. Encounter the swamps nature reserve of Los Erjos which is loved for bird watching by route TF 82. From there you also get to Santiago del Teide. 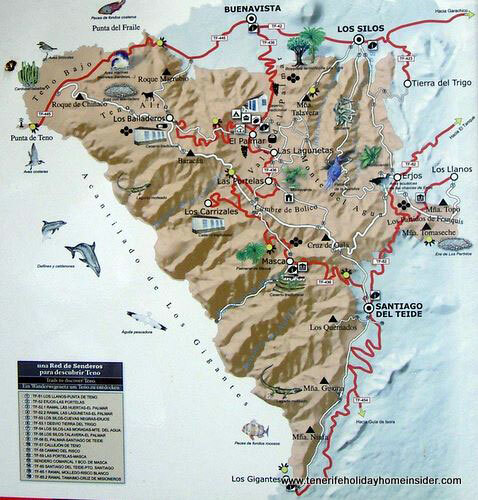 Discover on the Northern Buenavista map that the Tenian Massif and/or Teno Alto stretches from the northwest coast uttermost western point until Los Gigantes. Tenerife's most picturesque mountain village called Masca is to the other side of those mountains. Reach it via El Palmar, Las Portelas, Mirador de Baracán, Mirador de Gilde and La Vica on the road TF 436. From there proceed straight to Santiago del Teide, from where road TF 454 leads to Los Gigantes. It is clear to me that you cannot see the specified numbers on the map. So far, they only serve to show what hiking routes there are. I have a higher resolution photo of the Tenerife map Buenavista Norte, in case you need it badly. Return from map Buenavista Norte to Tenerife maps.